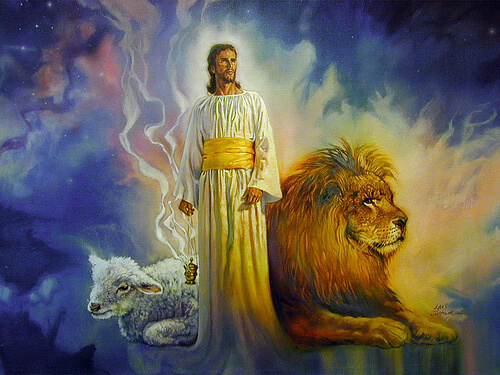 A Lion or a Lamb? Is He a lion or a lamb? Is He Master and Ruler, or Servant of all? Is He a vengeful God, or forgiving Savior? Is He so Pure and Holy that He can’t bear to be around sin, or did He pour out His blood to get rid of our sin? The answer to all of these paradoxes is YES! Does it make sense? No, but the wonderful thing about God is that He doesn’t have to make sense. He is God after all. His ways are not our ways and His thoughts are not our thoughts. So how do we reconcile the God that sent the flood, and Jesus who died for our sins? Let me first explain one thing you need to know about God. He is Love. No matter what He does, even wiping the human race off the face of the planet, minus the eight He saved, was motivated out of love. Think about this for a minute…what if He would have allowed the human race to continue? There was only one person that God said was righteous. Yes, his whole family was saved, but we don’t know if that was because the shared Noah’s obedience to God, or if it was just God’s mercy and love for Noah. How long do you think it would have taken for there to not be a single faithful follower? God, in His love for His creation, took action while there was still one. Think of Sodom. God would have allowed it to remain if there would have been even five faithful! Evil is like a cancer, it is caused by Satan, and then accepted and propagates in the flesh of men. You can’t cut out part of cancer, you can’t leave just a small cancer cell, you have to do radical surgery and cut it out. That’s what God’s cleansing did. Through His love and patience, a remnant always remained. Noah and his family, Lot and his daughters, the poor and week who were left in Israel after the enemy took everyone of import captive (after killing thousands). Always, He honored His promise to the founding fathers. For David’s sake, He always made sure to leave an heir. When His own chosen people demanded a king, and the majority of those kings led His people into idol worshipping, even sacrificing their own children, God’s hand, as a loving parent, was forced to discipline His children. Talk about tough love. Don’t ever think it didn’t grieve Him. He lamented over the loss of those He loved. We think we have to make hard choices. Time is winding up like a scroll. Soon and very soon, you will see Jesus coming in the clouds and the Holy Spirit will usher us out of here (if you follow Jesus). Will you be like James and John and ask God to call down fire on the rebellious? Or will you be like Abraham who reasoned with God for Sodom, or like Moses and Aaron who pled for the rebellious group they led, or maybe you will be like Amos who lamented over the loss of the house of Jacob and begged God? Do I want Jesus to come back soon? You betcha’! However, I also want to reach as many as possible before that great and terrible day. The finality of “the end” should motivate us! There will be no more grace, no mercy, no more chances for those who have refused Him. Those that are His will spend eternity with Him in the light of His love. Those who are not His will spend eternity in the dark, no God, no love, no light, and no hope. No because God is cruel, but because they chose. He is Love, He is Just, He is a strong Daddy who takes care of His children. He knows what’s best for each and every person and every decision He makes is for the best! Can you help them find their way to Him? This entry was posted in Thoughts and tagged Bible, choices, choose, Christ, christian, Christianity, faith, family, forgiveness, God, God's love, God's word, help, Holy Spirit, hope, Jesus, Lord, love, redemption, Salvation.